Re the title of this post - yes, CitySleuth is a diehard Beatles fan. Back to the movie - the newlyweds visit a number of popular Bay Area destinations as Myra proudly shows off her home town. Then ... They stroll down a trail through a grove of tall redwoods past the snapped-off tip of a tree impaled in the ground. ... and Now, this is Cathedral Grove at Muir Woods, a national monument since 1908, one of the few remaining stands of old growth coastal redwoods remaining in the Bay Area, just 12 miles north of San Francisco in Marin County (map). Today, the trail is lined by fences but the tree tip is gone - the arrow marks the exact spot where it used to be. ... a vintage photo ... How did CitySleuth find this exact spot? Well, during a visit to Muir Woods he came across this undated photo in the Visitor Center bookstore. Wouldn't you know it, this is the same tree tip, photographed from the opposite direction. It was in the Cathedral Grove next to a plaque honoring the memory of Franklin D Roosevelt. ... and Now, the plaque is still there but the tree tip has been removed, perhaps because it was in the middle of the trail (never mind that the tree tip was there first). The arrow marks the spot. For those inclined to visit, Cathedral Grove is indicated on the park map below (click image to enlarge). Then ... They drive up to the best of the City's vista points - Twin Peaks - to take in the evening glitter looking down Market Street to the Bay (map). A year earlier this same vista was used in the movie The House On Telegraph Hill. ... and Now, a recent view from the same lookout is even more impressive. The glowing dome of City Hall to the left and the illuminated suspension cables of the Bay Bridge were unseen at night sixty years ago. The rapid growth of the Oakland waterfront across the bay over the last sixty years adds to the glittering chiaroscuro. ... and Now, by day. Then ... They next visit the Golden Gate Bridge, shot here from halfway up the north tower looking towards San Francisco. ... in 1935 ... it's interesting to see the same view while the bridge was under construction, taken from higher up on the bridge's tower. The huge parade ground of the Presidio military base is clearly visible in the upper left and the dark strip above the Presidio is Golden Gate Park bifurcating the Richmond and Sunset districts. ... and Now, a recent photo on a foggy day. The bridge, enshrouded by fog about half of the time, requires constant repainting. Then ... Lester and Myra lean over the bridge's railing perhaps thinking of the two sad souls per month on average, year in year out, who climb over it on their final journey. The real railing however, though still controversially low, isn't quite as bad as this. ... and Now, this is the real railing. Look at the movie railing above - it's lower, has no rivets at the rail tops and has a different width to spacing ratio. 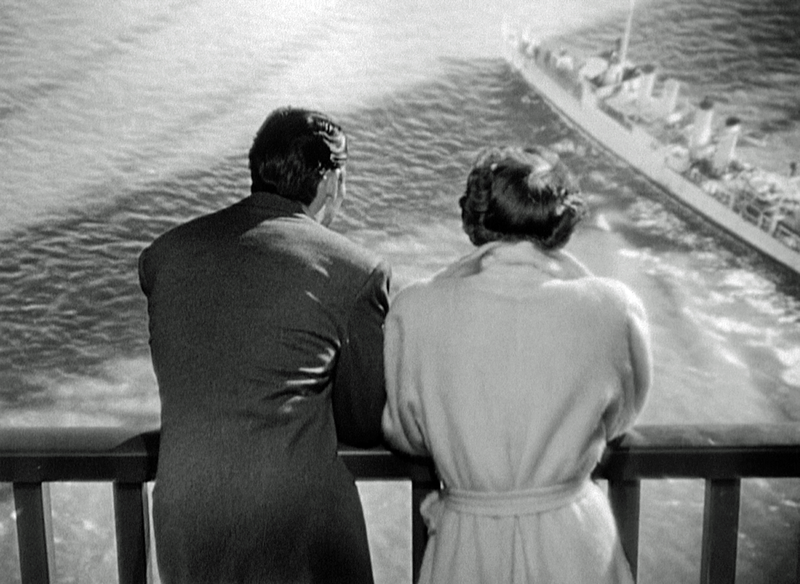 The movie footage was filmed in a studio using a background projection of the waters of the bay. Below, Angel Island and part of Belvedere and Tiburon are in the distance and Horseshoe Bay's Presidio Yacht Club marina is closer in on the left.